Split pea soup is one of my favorite soups. I can eat it any time of year in fact I just made a batch so I could write this recipe. Remember I usually “dump” and never measure so it is hard for me to say exactly how I make foods. 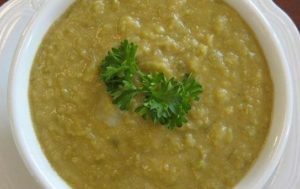 Split pea soup is a wonderful first solid food to eat after coming out of an acute pancreatitis attack or with symptomatic chronic pancreatitis (after the fast and juice phase) and starting out on what are usually safe solid foods again. 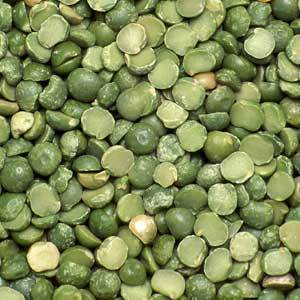 One of the benefits of split pea soup is the protein content. According to the package of the peas I use there is 11 grams of protein in a 1/4 cup of split peas. Green peas are extremely low in fat and a mega source of vitamin K, manganese, fiber, B1, copper, folate, phosphorus and vitamin C. Peas also contain a unique assortment phytonutrients that can lower inflammation (yep like in the pancreas) and the risk of cancer, heart disease and any condition associated with inflammation as a risk or cause. All in all there are a myriad of reasons to eat pea soup. According to this site I use to check out food nutrition there is 16 grams of protein per cooked cup plus a ton of other nutrients. When I look up split pea soup on the same site I find that there is 10 grams of protein per cup of soup. So I figure my soup is going to boast about the same protein and nutrition content. 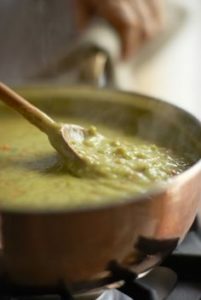 Most soup recipes (including pea soup) you’ll read about in cookbooks, online or on can and box labels will include oil of some kind. Of course for those who have recurring acute pancreatitis (do to an underlying condition), chronic pancreatitis or sphincter of oddi dysfunction oil (pure fat) is not a good thing. In order to avoid oil and other high fat ingredients often included in food recipes we, as pancreatitis patients, need to improvise, adapt, overcome. That is often easier said than done and I have found the best way is to simply cook at home, writing, or making up your own recipes. Let’s Make Split Pea Soup! First we are going to make my basic split pea soup. Underneath the basic version I’ll give you other ingredients you can add in order to make variations. 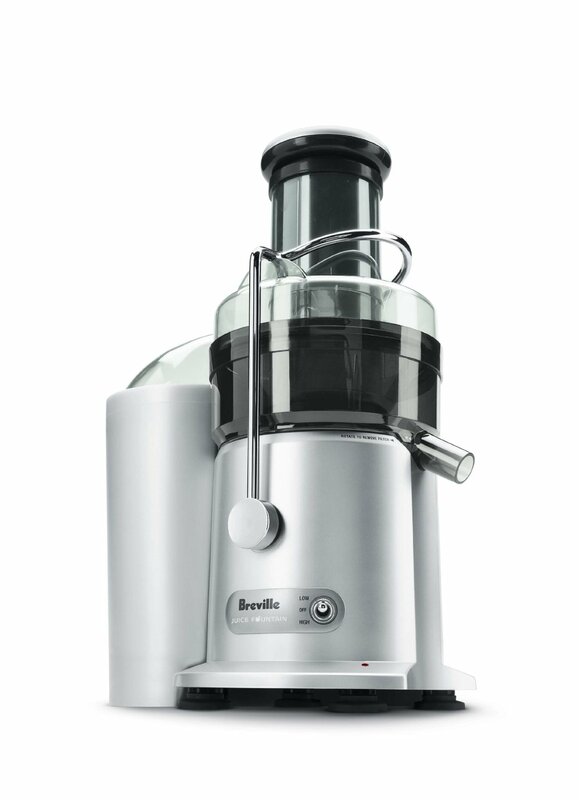 Note that making the variations will often change the flavor to something more atuned to a vegetable soup with a split pea base. 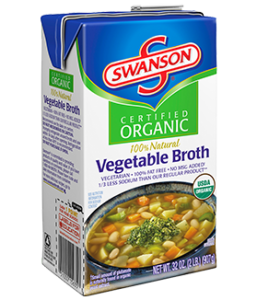 1 quart Swanson’s Organic Vegetable Broth NOTE: If you are a celiac like me you may not want to use this broth because it contains wheat! Supposedly the wheat has been processed in some manner to conform to FDA “gluten free” standards. I choose to make my own vegetable broth which is a pain but necessary for my health. Empty the pound of split peas into a 5 quart pan. Put them under the faucet (running almost hot water) and rinse the peas thoroughly swishing the peas with your hand. Pour off water (will be a soapy looking water) being careful not to pour out the peas. Repeat until the water runs clear. Once the water is clear and the peas are clean fill the pan with water until there is about one inch of water above the peas. Set it on the stove (high heat) and bring to a boil. 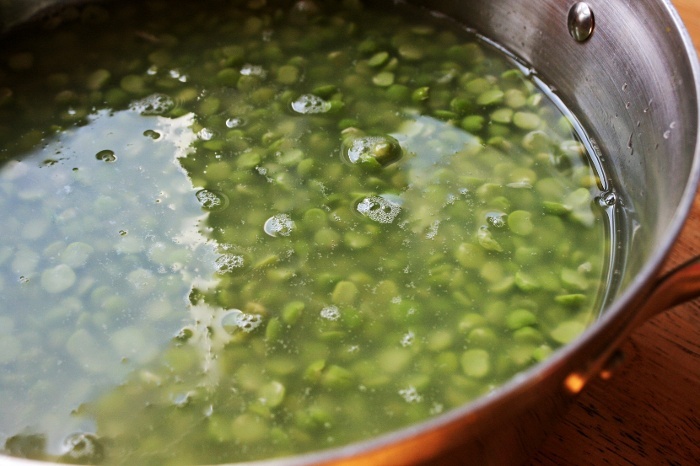 Once peas come to a boil, stir them and make sure none are sticking to the bottom of the pan, then decrease heat to medium and continue to slowly boil the peas for about an hour or until they begin to turn into soup. Do NOT add ANYTHING until the peas are breaking down. Just peas and water. You might have to add some water so keep your eye on the peas you do not want them to burn! Once the peas have begun to break down add the potatoes, the carrots, the celery, the onions and simmer for another 15 minutes. Stir up nicely. Watch the peas, don’t let them burn. Add the vegetable broth and spices and then simmer for another 15 minutes. Stir the soup and check to see if it looks like soup. Check the peas and veggies for tenderness. Dish your soup up and cover the top in green onion! Oh my gosh!! Since I’m on holidays this week, this is going to be made and I’ll freeze part of it too. Your recipe looks mouth watering! I love split pea soup!! thanks for the recipe. is protein even in little amount allowed? I love pea soup. In fact I love all kids nds of bean soups. Are other bean soups allowed, like navy bean soup? Hi Nora – peas, lentils or red, black, white, navy, lima, kidney beans (not soybeans they are high in fat) are safe as long as they are not combined with unsafe foods.